See the best of San Francisco all in one exciting day with this 3 Hour Segway Tour coupled with ferry and admission to Alcatraz. Get personalized guidance from your instructor during your Segway tour including Aquatic Park, Lombard Street, North Beach, Pier 39, and gorgeous views of the Golden Gate Bridge, Bay Bridge and Coit Tower. Take the ferry to Alcatraz Island and enjoy the comprehensive audio tour of the notorious former prison at your own pace. 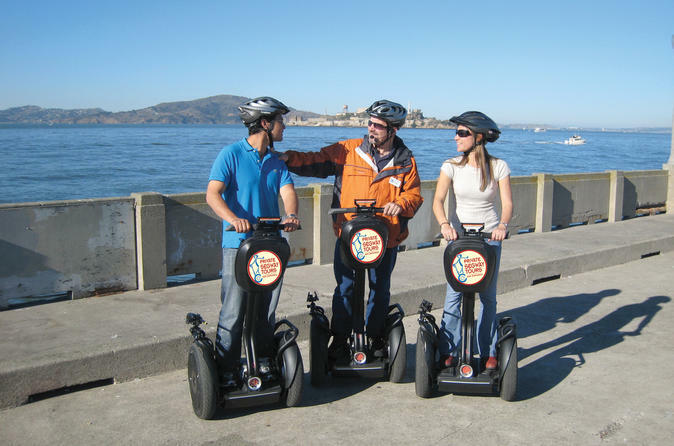 For the Segway Part of the Combo Package: Meet your expert guide at Fisherman's Wharf in San Francisco, and learn the ins and outs of riding a Segway during a 25-30 minute training session. Riding a Segway is easy and by the end of your orientation you'll be ready to conquer the streets of San Francisco! Rest assured, your guide will keep a close eye on you and tailor your itinerary to your skill and comfort level. Glide along the waterfront and see Aquatic Park, San Francisco Maritime National Historical Park, and breathtaking views of the Golden Gate Bridge, San Francisco Bay and Alcatraz. Ascend into the upscale Russian Hill neighborhood, and take in more stunning vistas of the bay, the Bay Bridge and Coit Tower. Pause for fun photos at hidden stairways and paths, and climb alongside San Francisco's iconic cable cars to the top of Lombard Street, which is well known for being extremely crooked! If you're up for it and your guide feels you're ready, cruise along the hairpin turns of this famous street. Make your way down Telegraph Hill toward North Beach — San Francisco's Little Italy — and admire Saints Peter and Paul Church in Washington Square Park in the heart of this lively neighborhood. Head toward the touristy hubbub of PIER 39, and delight in seeing San Francisco's famous sea lions as you come to the close of your 3-hour Segway tour. Enjoy some free time during which you can grab lunch (own expense) at one of Fisherman's Wharf many eateries. For the Alcatraz part of the Combo Package: Head to Pier 33, and arrive half an hour before the designated time of your late ferry to Alcatraz Island. Board your ferry and ride to the world-famous island to see the prison where no one is believed to have escaped alive. Learn about the storied history of this foreboding penitentiary through your self-guided audio tour, available in 10 different languages. Take your time visiting the well-preserved historical buildings and soaking up the haunting atmosphere. When you're ready, use your round-trip ticket to re-board the ferry for the ride back to San Francisco; Alcatraz ferries depart every 30 to 40 minutes. All Alcatraz departures are the same day as your Segway Tour. If your Segway Tour is at 9:00 AM, then your Alcatraz departure will be later that afternoon (e.g 3:40pm). If your Segway Tour is at 1:30 PM, then your Alcatraz departure will be early that morning (e.g 8:30am). You will receive your exact Alcatraz departure time after booking this combo package.